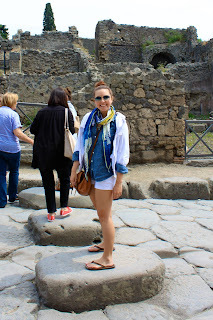 We woke early to catch our transfer to the ancient ruin city of Pompeii, located just southeast of Naples and the great Mount Vesuvius, which blanketed the city with volcanic ash in 79AD, sadly killing everyone in sight. Our guide, Elvira (though her personality was opposite what her name suggested), met us at the gates to the eerily vacant town. Though populated with tourists, there was still something very lost and sad about the site. 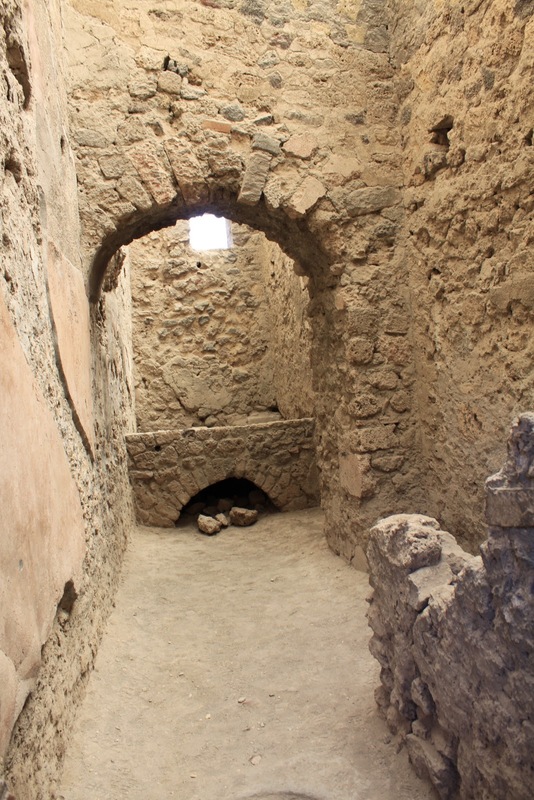 We first entered the gladiator training area and barracks, where gladiators would prepare and practice for their turn in the ring. We then ventured to two performance amphitheaters. One for music and the other, more larger venue, for theater. While excavating, archaeologists found several preserved instruments in the orchestra area of the buildings that can now be seen in the museum in Naples. Walking along the rocky streets you can see long worn-in impressions on the stone from where chariots passed by. 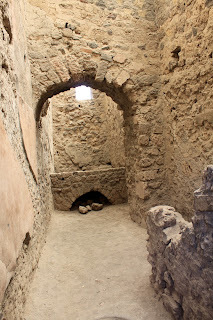 Because the streets got so dirty, given the lack of proper sewage systems, water was constantly washed over the rock to clean away the dirt and dinge. The streets were always wet and thus, raised stones were placed as a sort of walkway for patrons to keep their clothing from getting damp or dirty. The citizens of Pompei were actually very forward thinking when it came to food. It would be appropriate to credit them for the idea of "fast food" considering they had several shops along the main streets where a passerby could purchase a quick bite to eat from a storefront window. Patrons could see what types of stews or food was available by peeking into the big clay vats insulated by the stone counter and could grab their taste right off the sidewalk. 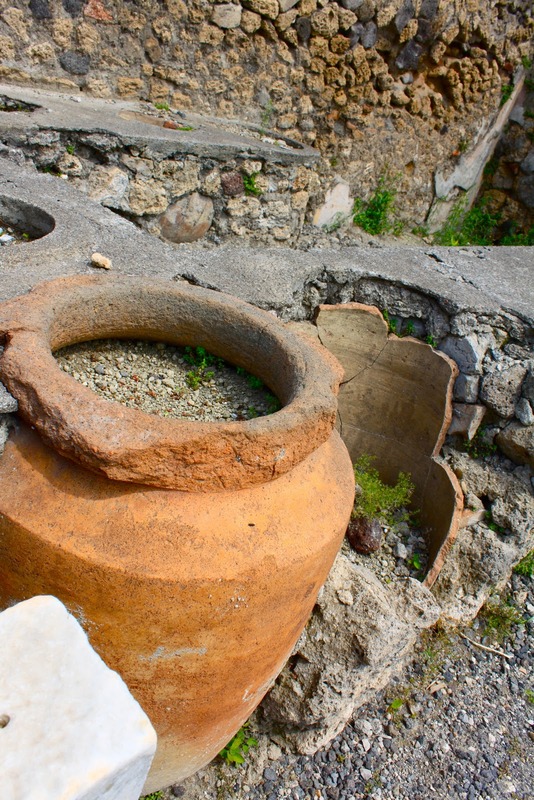 The people of Pompei were also skilled bakers and had mastered the art of crafting large ovens. Most kitchen areas in the homes of the wealthy featured their own ovens, but there were also "bakery" type stores where goods could be bought and brought home. In addition to their advances in cooking, these people had also perfected their own water system. 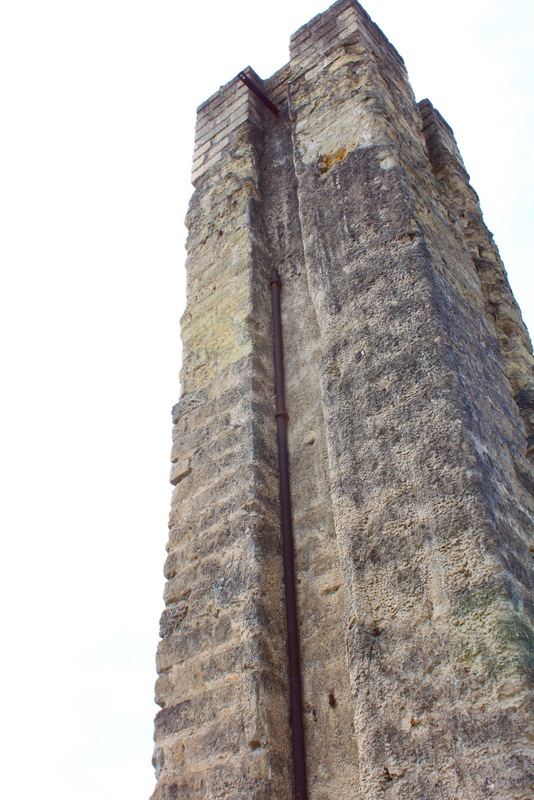 Though the water traveled through lead pipes (probably not so great for their health), water could travel throughout the city freely and into wells for drinking. The wealthiest of citizens lived in villas, which sported their own small kitchens and lavish dining rooms with gorgeous frescos adorning the walls. I could have walked the streets of Pompeii for hours on end, exploring all the different storefronts, villas, and of course the famed brothels (which I will refrain from posting pictures of because of their not-so-"tasteful" nature). We did visit the public baths, where citizens went to bathe, relax, unwind, and take care of business (in more ways than one). We also went to the city center, where there had been a modern marketplace to trade or buy goods, all of the political buildings, and also religious centers and temples. There was so much to take in, but walking around the preserved ruins, it was easy to picture what life must have been like back in '70s (obviously not the 1970s). After our informative but somewhat quick tour, we hoped back in the van and headed back towards the beach in Positano, to Tre Sorelle, where we had our welcome dinner on our first night. We met with one of the granddaughters of the original "three sisters", who currently manages and runs the place along with her family. Though we were there for pizza making, we started with two fun appetizers; flash fried zucchini chips and deep fried eggplant. We used a very sharp mandolin to thinly slice the zucchini as teeny as sheets of paper. Once sliced we threw them into a pot filled with hot olive oil and pulled them out almost as quickly as we tossed them in. We then coated them with sea salt, cracked pepper, white vinegar, and set them aside. We then washed, drained, and squeezed (to get out the excess water) the eggplant to prepare for frying. Instead of slicing it into chips, we cut the eggplant into cubes, coated them in some flour, and fried them deep and much longer than the zucchini. Once finished, we sprinkled on salt and pepper and added them to a larger saute pan with crushed grape tomatoes, garlic, and more olive oil. We let the ingredients marry for a couple minutes and then emptied them out into another perfectly painted ceramic serving dish. Once we completed our amazing apps, we moved onto the main event; Pizza! We first learned the basics of dough; flour, yeast, water, and olive oil. We dissolved a cube of yeast in some warm water then added the frothy mixture to a small flour mountain we had formed on the table. We got our hands dirty mixing the yeast and flour together, adding a little salt and olive oil till the dough formed the right consistency (which is of course, whenever our little non-English-speaking pizza expert tells us to stop mixing). 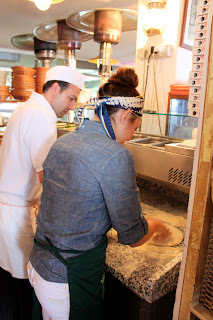 We set the dough aside in these large tupperware type containers to rise, but thankfully at Le Tre Sorelle, they always have dough ready to go, so we grabbed some already risen rounds and go to working. Pizza dough can be very finicky. Overwork it and it tenses up so tight you can't hardly get it to spread out. 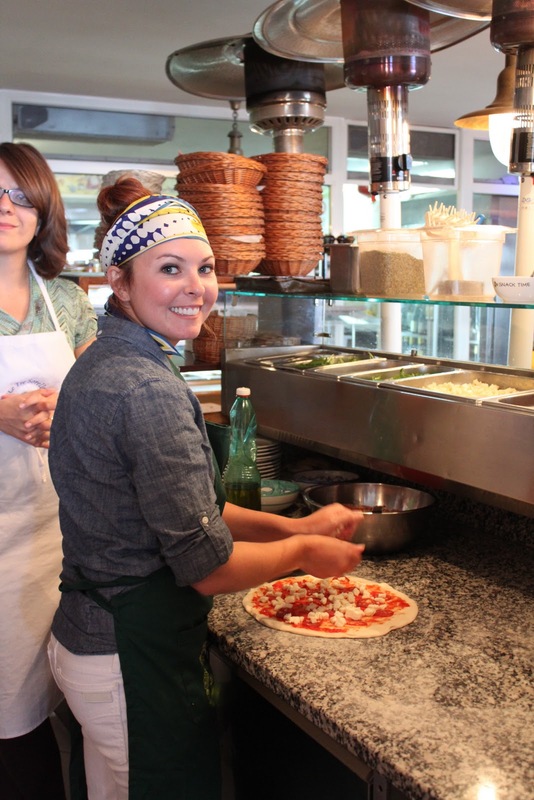 Underwork it and you'll probably have a way too thick pizza, bordering Chicago style, but without the deep dish to justify your poor job. It takes a delicate but deliberate hand, gently spreading out the dough, starting in the center and working to the edges in a circular motion. (Did you get all that?) Don't try anything ridiculous like tossing it in the air. You will only end up overworking the dough and/or taking out a friend because the dough is actually quite heavy. 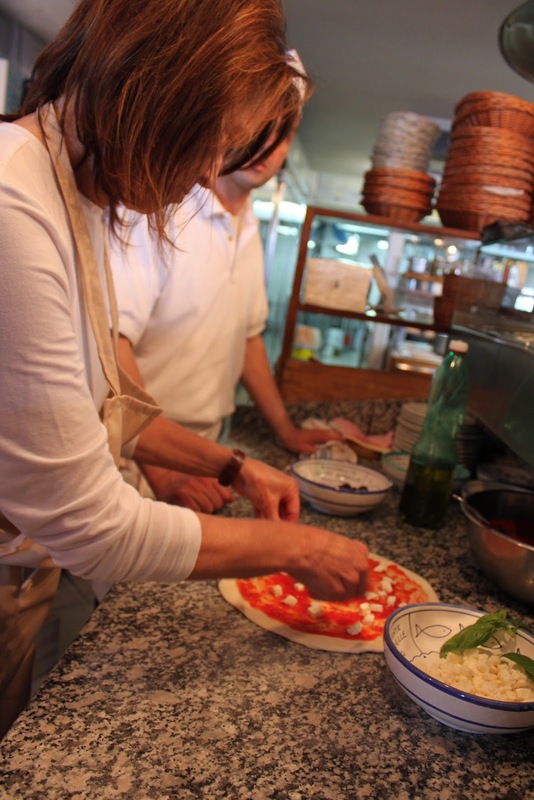 Once we had our round and relatively thin slabs of dough, we added just a touch of tomato sauce (pre-made by the Chef's at Tre Sorelle). We only added just enough to coat the dough, being careful not to over-sauce, which would make the pizza too soggy. If you are huge tomato sauce connoisseur, my suggestion would be to have some for dipping on the side. To me, the best pizzas only have a few toppings in addition to the mozzarella; spicy salami and basil, onions and peppers, olives and pepperoncini; the simpler, the better. You also can't go wrong with adding a little olive oil tossed fresh arugula to the pie once its out of the oven. panna cotta.. not so pretty, but boy did it taste good! Sadly, this not only was our last class in Positano, but our last night on the coast. We savored every last bite of our dinner and took in the last sites of that beautiful dreamlike city. Tomorrow, ROMA!